These verses reminds me of those days in my Catholic community, as well as days of reading and re-reading Nicholas Sparks’ A Walk to Remember and crying as Landon read these passages to Jamie. I’ve heard them said so many times during wedding videos that my brother makes, and quoted so many times in blogs and posts about love. These verses have the power to make me feel all tingly and good inside as well as convict me of the times when I’m not as loving as I should be. I remember during one of my heads in my Catholic community tell us that these verses on love sets the standard on what love really and truly is, and if I can replace “love” with my name, that means I am somehow living this. I’ve never really tried that because halfway through, I’d feel guilty because I know I’m not what love is. I’m not always patient, I’m not always kind. I am proud, I envy, I boast, I am self-seeking, I am easily angered, I keep records of wrong. As much as I’d like to believe that I can be what these verses say, I am only human and I fail way too many times. It took me a while to write a review for C.S. 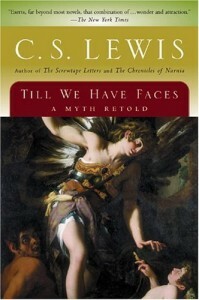 Lewis’ Till We Have Faces because I wasn’t sure what to write about it. I had to mull it over for two weeks until I remember what Paul said to the Corinthians and realized that this is what the novel is all about. Till We Have Faces is told by Princess Orual of Glome, the unattractive daughter of a tyrannical king, who loved her half-sister Psyche so much that she couldn’t see past her love that she thought was the only thing right. It was a bad time in Glome when Orual was at her highest, loving and caring for Psyche not just as a sister but as a mother that they never had. Orual’s world is shattered when the priests of the goddess Ungit tells their father that they need to offer Psyche as a sacrifice to the fearsome ShadowBrute to appease the goddess. Orual thought it would be the end of Psyche, but to her surprise, she finds that a god has fallen in love with Psyche and made her his wife. As Orual wrestles with the turn of events, her heart and the gods themselves, she finds that there was more to love that she needed to learn and unlearn for her to truly understand what love really is. This is unlike any other C.S. Lewis novel I’ve read, but I’m no authority since I haven’t really read them all. I probably wouldn’t have heard of this book if it weren’t for my friend RE, and I wouldn’t know that this is known to be C.S. Lewis’ best work. Till We Have Faces is rough, almost brutal, but there is a beauty in the story that satiated my need for very good fantasy. It’s deep, but not so much that you wouldn’t understand the story or the writing as you read it. It almost didn’t feel like it was a Lewis novel, with all the gods and goddesses and pagan practices in it. But Till We Have Faces creeps up on you slowly, taking over your mind as you try and mull over the ideas and thoughts it presented. Well, that’s what it did to me, anyway. It was hard to review the book because I didn’t know how to approach it. I wasn’t sure which character I related to, and I didn’t know how to discuss the story without giving away or missing the important points. I enjoyed reading it, but I think this is the type of book that needs re-reading every now and then to fully understand it all. I’m not saying that I didn’t enjoy it — I did, very much. It’s just…deep. And like I said, its depth forced me to think and to see how similar I am to Orual. I wonder what Orual would have thought of what Paul wrote to the Corinthians about love. I wonder if I would act the same way as she did when she found out about Psyche being a wife of a god that I cannot comprehend, of how the person I loved the most longed for something else and how my love cannot satisfy her. I wonder if the love I give is as possessive as Orual’s, and if this would eventually cause the death of the people and the relationships around me. I wonder if I will ever be able to know and see love as Psyche did, and if my name would ever be worthy enough to replace that word in Paul’s epistle. I think that’s the real strength of C.S. Lewis’ works: not only do they entertain, but they make the readers really think. Till We Have Faces is a beautiful novel, definitely one that needs to be present in a reader’s collection and revisited every now and then. I’m buying my own copy after Lent for sure.